It's official ! 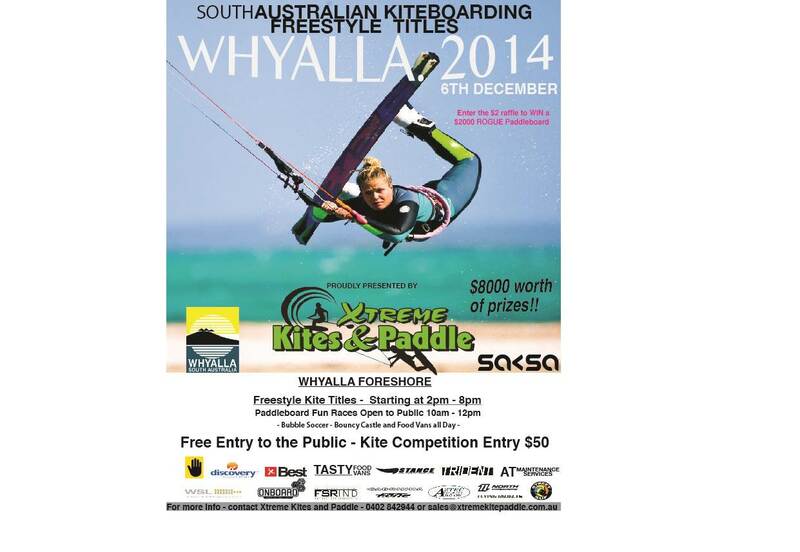 SA Freestyle Titles Dec 6th 2014 in Whyalla with a back up day on the 7th. Brought to you by SAKSA & Xtreme Kites & Paddle. Looking forward to see some nice flat water riding with hopefully strong sea breezes and all the crew from around the state. This is going to be a super fun event with also some Sup Racing in the morning (semi pro's and amatuers) and a fun St Sup Race to join the festivities with an all mighty presos and party on the saturday night . SAVE the date with more info coming soon ! Ok Crew ...as Jordo from SAKSA would say "It's on like donkey kong with ping pong". State Freestyle Titles def a go ahead on Dec 6th 2014 in Whyalla. We have the Whyalla Council helping with sponsorship and Whyalla foreshore will be ready to rumble. It's time to book some accommodation - Whyalla Discovery Holiday Park smack bang on the foreshore are also helping out with sponsorship and are offering 10% discount when booking for all competitors and family , let's support these guys. An added bonus is the Preso's and afterparty will be no more than 50m away at the Westlands Soccer Club who will cater with Charcoal Chicken & salads. The bar will be cranking on friday / sat night with Shooters only $5 all night and they will open til 1am for us with a pool and table tennis table so we can all gang up on Howdou the ping pong magician ! If you can't get into the park Whyalla Foreshore Motel are also offering a great discount. Remember you have to be a SAKSA member to enter this comp so head to the SAKSA site and sign up asap . How old do I have to be Easto so as not be up against you in the masters. Keep younger than 35 EB if you don't want to play with us old guys. Can't wait should be a great event. It will be worth the trip just for the charcoal chicken that's one thing Whyalla does best. It's the only town i know of that sells charcoal at every grocery store, and every true local has a modified laundry sink in there back yard to cook Whyallas very unique charcoal chicken on. I remember being 35 better get some more training in then 5 days on offer this week. Grand masters for you Roger ...and your in with me and Waxy EB & you wanna hope someone knocks Martin Bone out in the bubble suits before his heat ! Jordan Roberts may enter masters too , he's a gun in pink boots! and i heard a rumour Croc may show. Kickass my leave has been approved for the comp time to book a site at the caravan park and load up the trailor/esky, with just over 5weeks to go I'm going to need some practice........and if I get sick of drinking I might even try out my new kite. Here it is the long awaited poster - 5 weeks to go guys and girls ! Prizes for every entrant . Get to Whyalla Dec 6th. I am frothin for a bit of flat water! Everyone better get in on it for an awesome day. Kitingtopher - we're working on this as we speak mate. Hit a bit of a hurdle but sign up will be available really soon. Yep 3 weeks to go crew ! Hope you have your beds sorted as they are booking out fast. Don't forget to bring your sups & St Sups up to Whyalla as we have some great trophies & prizes up for grabs in the sup races also. The TV advert has started over this way and Whyalla Council are predicting a huge crowd. It will be great to catch up and watch Andy Yates rip it up in a demo and what an awesome effort from SAKSA to get him to Whyalla for head judge !!! You... the competitors are the key to a comp so the $50 entry fee includes a free tee , bbq lunch with a free drink and also charcoal chicken & salad at the presos. Obviously this comp couldn't of been put togther without these great sponsors - Xtreme Kites & Paddle , SAKSA , Whyalla City Council,AT Maintenance,Swear By Safety,Discovery Holiday Park Whyalla,Tasty Food Vans Whyalla, Best Kiteboarding ,Trident Sup Paddles ,STANCE, WSL,Onboard, FSR Industries, F-One Kites , Cabrinha,Aztec Glass Whyalla , North,Flying Objects & St SUP. Get on ...sign up and get stoked for this awesome comp with a great weekend full of great people ! Get on it guys and girls, this is going to be an awesome weekend. If you have never kited Whyalla before, just to let you know,it's AWESOME! This place is a world class flat water destination, it's as smooth as you will get anywhere. So get behind this great event and support the crew who have spent the time and effort in making this happen, you won't regret it. You will meet awesome crew and get to kite one of South Oz's premier kiting locations. As well as going into the draw to win some awesome prizes. Ok guys and girls ...10 days to go until the biggest comp to hit in Whyalla in years ! $8000 WORTH of PRIZES / CASH & TROPHIES !!! Kite Comp ,SUP races , Bubble Soccer , Food Vans , Jumping Castle , Charcoal Chicken & $5 shooters at presos with ping pong comp and a demo & tips from Andy Yates! You can't miss this comp. Remember you have to a SAKSA member to enter this comp and don't forget to register as we need to know numbers asap for catering ..
Jump on and sign up asap guys and girls . Come and support the west coast crew and enjoy our side of the coast this year ! Hey everyone, my names Henry was wondering if anyone has a spare seat and room for kite gear for the trip to Whyalla and back. If anyone is going over early Friday that would be great because I'm giving Easto a hand. Happy to make a contribution towards petrol. So keen for this comp! Hi all , Whyalla States forecast so far for friday 18 to 22 kts ssw and sat 20 to 25 kts ssw ! Bring it on !!! Come down for this epic comp and support our great sponsors below with the biggest ever prize value ever in any kite comp in South Australia. Congrats to Croc for Rachelle saying YES to marry him and also for saying YES for him to come to Whyalla !!! WHYALLA STATE TITLES forecast -What a weekend for wind. Friday -15 to 20 kts freshening in the afternoon to 18 to 22 kts ssw - Kite comp warm up and ride with Andy Yates and watch him rip it up ! This weekend is the best forecast i've seen for any comp in years !!! What's the cut off time for signup on Sat morning? Thinking about doing an impulse drive over in the morn. Easy as, get over here conditions are going to be epic if tonight was anything to go by. WOW ! what a day ...what a comp and what a party. One of the best comps i've ever witnessed in 15 years of kiteboarding. Super stoked everyone turned up and had a blast. Thanks again to all the sponors and the SAKSA lads for running an elite judging panel along with super dude Andy Yates ! A special mention to the Westlands Soccer Club , The Whyalla City Council , Tony Leach , The King Family and Jake / Jac for all their help with organising this comp with me . An Awesome day to remember forever ! 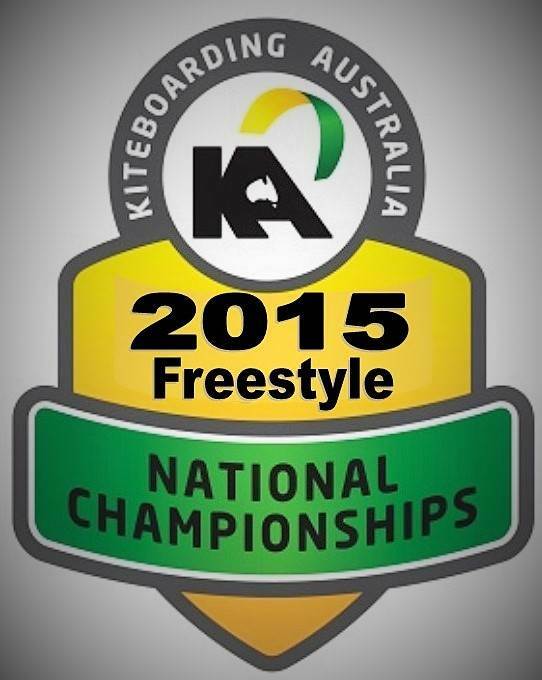 OK, we need some SA-n's to ENTER the SYDNEY FREESTYLE NATIONALS! March 12-15. All states are IN , but we know there are a few TOP kiters in SA to give anyone a run for their money! Cheap accom at the Cronulla YHA, which is now nearly full of kiteboarders and costs $33 a night! Book a cheap airfare and the rest is done. WE WILL PICK YOU UP from the AIRPORT! So no need to rent a car!!! We have lots of sponsors and kiters willing to help out with your every whim! So come on SA - JUST DO IT!! You could pick up a sponsor, or take home a great prize and of course the medal!! If YHA is booked out let us know, we can find some share accom with some local kiters etc !!! Link to register and pay the $90 entry fee - which includes a Hi Quality event tee valued at $45, also inc BBQ and other stuff!